Adam Wainwright became a Cardinals legend in his rookie season six years ago, clinching the National League pennant on a wicked curveball Carlos Beltran still sees in his nightmares. 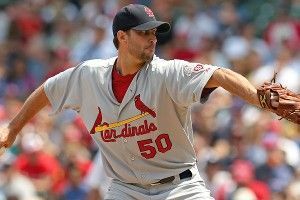 Converted (back) to full-time starting pitching duty the next season, Wainwright began a climb that would take him into baseball’s elite ranks. In 2009 and 2010, he was among the league leaders in every conceivable pitching category … wins, strikeouts, ERA, FIP, WAR, and several others. Then, the reckoning. The following offseason, Wainwright’s elbow started barking. A month before his teammates headed north to start the 2011 season, he was on the operating table, undergoing Tommy John surgery. There’s never a good time for a year-plus of recovery and rehab, but Wainwright’s timing was especially rough: He watched from the bench as his team pulled off one of the most memorable World Series runs of all-time (though he took his cheerleader role very seriously, and very literally.) He made it back to the mound at the start of this season, and struggled at first. Things took a turn for the better in late May, starting with a four-hit shutout of the Padres on May 22. In his past 13 starts, he’s been pitching like the Wainwright of old, striking out 83 batters, walking just 17 and yielding just four homers over 85⅔ innings. Before Thursday’s game at Coors Field, Wainwright sat down to discuss his long and painful recovery from surgery, the challenge of losing your confidence when things don’t go your way, and the turning point that finally got him back to pitching the way he wanted. Let’s start by talking about those first few weeks after Tommy John surgery, trying to get your arm back to normal and eventually make it back. It really is a grind. You have two months’ time where you have about a pound-and-a-half, two-pound limit where that’s as much as you can lift. You have a bunch of new action in your elbow, a new ligament, scar tissue, a lot of new stuff going on. You don’t want to complicate things by jerking anything out of place. Gradually that weight increases. But I can remember being in the shower, two weeks after surgery, having the shampoo bottle in my hand, not having the strength to hold it, and the bottle falling right out of my hand, hitting the floor of the shower. It’s a slow process, for sure. They’ve got it down to a science, though. They know how you’re going to feel before you know how you’re going to feel. Obviously it was a great season for the team last year. But it’s got to be so tough sitting there, not being able to contribute, no? Well, if you think about it, the difference between a serious injury like Tommy John and a smaller injury is that with the bigger injury you’re granted a certain amount of peace, because you know there’s nothing you can do to get back for that season. So you might as well be a positive influence. At the same time, you could also get somewhat depressed about that, because there’s nothing you can do to get back on the field that same year, so it’s kind of a Catch-22. What about the guys in the clubhouse? Did you feel like you were being treated as an outsider at all? No, not at all. The team made me feel so welcomed. And I know how that is. You could very easily be a guy who gets in the way or gets annoying if you’re in everybody’s face all the time, you’re hurt, and you can’t contribute in any way. But they made me feel like family, that I was supposed to be there, and belonged there. And to be honest, I felt like I did, too. It was almost like I was playing. You get back for spring training, and your velocity was back to what it was. Still, was there any reticence about really letting go, knowing it had only been a year since surgery? From my first start until the end of spring training, my stuff was great. I was throwing easily 93, not even trying hard. 93 with sink. An easy 93, playing-catch 93. My curveball was snapping, my slider was good, and my changeup was nasty. Each inning I got stretched out further and further, my arm became a little more taxed. Right at the end of spring training, I started to feel that a little bit — where my stuff started to waver. My arm still felt fine, but my stuff was starting to fade. There was just no late life on the fastball, which is huge. There was no late bite to the curveball. There was no location or movement in my slider and changeup. And my velocity dropped. That was just a matter of the innings. Had I been a reliever, I would have been able to go out and throw hard in short stints and been fine. I really believe that. But as a starter, it’s a tougher process. So at the beginning were you just thinking about getting through five or six innings a start, being careful? No, I wasn’t being careful. One thing about the surgery is, when you come back, your arm is as strong as it’s ever been. Your elbow ligaments are intact. The muscles in your shoulder and your elbow that support that are so strong from your rehab process. They tell you, “Go out there and pitch, you’re not going to be hurtin’.” Just go out there, trust that the surgery worked. And it has. It took me a good month and a half to get that life back, though. And my numbers really suffered for it. I was grinding, just trying to figure out a way to get through six innings early in the season. Was there a “lightbulb” moment this season — a pitch or an inning where things started to click? Sure. It was a bullpen session in between a mediocre start I had and a start against San Diego where I threw a complete-game shutout, in May. I made some good adjustments. I realized my arm slot had started to creep out of position. And a very important thing happened — I found the grip in my curveball that I’d always had. I didn’t know [that I had the wrong grip]. I kind of tweaked my hand position just a hair and all of a sudden it just locked in. And my curveball is such that when I have that correct grip, I know it’s going to be a strike before I throw it. It just feels like it’s going to be a strike. I hadn’t had that. Before that, I was throwing 67-foot curveballs, and 57-foot curveballs. The last few starts have been much better. We’re getting to the dog days now. And this is a good team with a chance to make it into October again. In your mind, you’re coming back from Tommy John surgery, you could get to 220, 230 innings if you advance in the playoffs. Are you thinking about that, about handling that workload for the rest of the season? No, not at all. I can’t think like that. What I’ve gone through this year, I’m probably not going to end up where I normally am statistics-wise. I’ve made peace with that. I’ve realized that the first half of my season and the second half of my season are going to be two completely different seasons. The amount of comfort I feel now, being confident on the rubber, confident in my pitch selection, in my pitches, the life on the ball, is completely different, 180 different, than it was in the first half. You can look at the numbers and see that. They don’t lie. I’m just going to continue to trust the process. When I’m going strong like I know I can, I feel like I’m a force to be reckoned with. And before, early in the season, I was just hoping they wouldn’t get an extra-base hit. It was, “Please God, don’t let this guy hit in the gap or over the fence.” And that’s something I’ve never thought about. Never, never. Very confident on every pitch. I’m going to make this pitch, and if not, I’m going to make the next pitch. That’s where I was before. And after everything that’s happened, that’s where I am now.